Since graduating with a Grand Diplôme in 1996, Héloisa has explored a diverse range of paths in the world of cuisine, running a cooking workshop for amateurs in Brazil for ten years before opening up her own restaurant, Lá Da Venda. Héloisa Bacellar was an attorney in Brazil for more than 20 years before deciding to focus on her childhood passion: Cuisine. 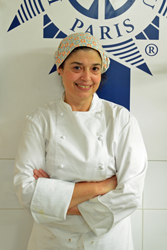 In 1995, she came to Paris with her husband and 3 year old daughter and signed up for Le Cordon Bleu Grand Diplôme. Whilst at the school, she also followed bread baking workshops and enology courses. Following graduation, Héloisa returned to Brazil and, with a friend, opened a school giving workshops to amateurs. During each three hour workshop, two dishes were made. Ten years later, she decided to sell the school in order to dedicate herself entirely to the opening of her restaurant, Lá Da Venda (Vila Madalena - R. Harmonia São Paulo - SP Brazil). The restaurant is based on a unique concept as it includes a pastry shop, bakery and store. Lá Da Venda is a welcoming and colorful all-in-one business with, at its heart, a store selling artisan products. Héloisa perfectly marries the French culinary techniques learnt at Le Cordon Bleu Paris with local ingredients and her cuisine is both authentic and full of flavor. Heloisa has received a number of awards, including "best cheese bread in São Paulo" (pão de queijo). She has also written a number of cookbooks, which are best-sellers in Brazil: Cozinhando para amigos I (2005), Cozinhando para amigos II (2008), Chocolate todo dia (2009), Bacalhau (2009), Le bon marché – Le Brésil à Table (2013), Made in Brazil (2014). Made in Brazil was written in partnership with Larousse and includes 30 easy recipes (20 savory and 10 sweet), using ingredients that can be easily found worldwide. In this book, Héloisa highlights the richness of Brazilian cuisine. A seventh book is planned for 2014: Brazil a mesa.